Rizwan is responsible for technology scouting and identifying disruptive technologies for the Citi in EMEA, primarily in the Enterprise IT and FinTech space. Rizwan has extensive experience of working with start-ups and early stage companies, where in partnership with the vendors, he has taken solutions from the ideation stage all the way to production. Rizwan has been a mentor in a number of accelerators since 2013. 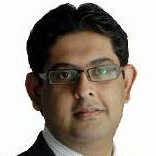 In his previous roles at Citi, Rizwan has been responsible for IT transformation and re-engineering, large scale technology programme management, Information Security Projects Portfolio for EMEA, Product Engineering and post M&A IT integrations. Rizwan holds an MSc in Electrical and Electronics Engineering from Imperial College London (2005). He graduated with an MBA from the London Business School in 2013 where he specialized in strategy and entrepreneurship.